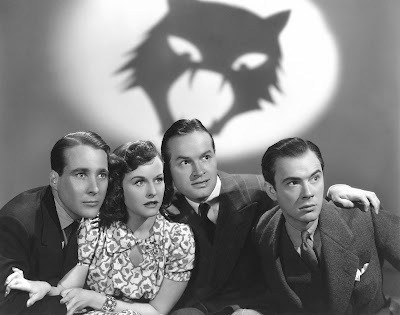 The Cat and the Canary (1939), starring Douglass Montgomery, Paulette Goddard, Bob Hope, and John Beal, is one of the 1001 classic movies you should see. Each Monday, I'm going to recommend a classic movie you should see (for the reasons behind the 1001 series and reviews of earlier films covered go here). October's selections will focus on felines in film. This week's movie is the horror comedy, The Cat and the Canary (1939). The Cat and the Canary begins when six heirs of eccentric millionaire Cyrus Norman travel to his remote Louisiana mansion for the reading of his will on the tenth anniversary of his death. Cyrus leaves his entire fortune to his beautiful niece, Joyce (Paulette Goddard), provided that she and the other five heirs can spend the night in his creepy mansion. Complications arise from a forbidding housekeeper (Gale Sondergaard), missing lawyer (George Zucco), and an escaped insane asylum inmate who is stalking the grounds. 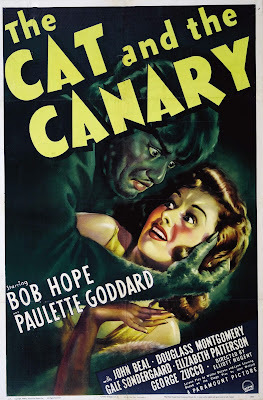 The Cat and the Canary is the third screen adaptation of John Willard's stage warhorse: the 1927 silent version is considered one of the first horror classics, and it was quickly followed by a sound remake, The Cat Creeps (there are no prints of that film in existence). Paramount Pictures decided to make a third version as a showcase for Bob Hope, who was then a rising star at the studio. The result was a fast, funny, and scary film that is a Halloween favorite for many classic movie fans. Although The Cat and the Canary features a black cat, a housekeeper who resembles a cat, and a feline-like serial killer called "The Cat," the movie's title comes from a very different source. There's an old legend that says a caged canary can die of fright while being stalked by a cat. Joyce reads a version of this story in the mansion's library, and, after she is declared the sole heir, she becomes the canary-like target of a malevolent person who wants Cyrus' fortune for him or herself. 1. Horror tropes. The Cat and the Canary didn't invent haunted house movie cliches like secret passages and eyes that move in portraits, but direct Elliot Nugent masterfully uses these tropes for both laughs and scares. 2. Hope. The Cat and the Canary cemented Hope's status as a top box-office star and led to his series of wildly successful Road movies with Bing Crosby and Dorothy Lamour. He gets off several great one-liners in this movie, including a joke about the spooky flickering lights ("that's what happens when you don't pay the bill") and a wisecrack about Republicans that is still funny and relevant in 2016. 3. Goddard. Much like Carole Lombard, Goddard was a glamorous actress, who possessed great comic instincts. In fact, this movie and Ghost Breakers (1940), her other horror comedy with Hope, feature two of her best screen performances. 4 Elizabeth Patterson. Old Hollywood fans will recognize the character actress from her wonderful performance in Intruder in the Dust (1949), but Patterson also had the distinction of playing Aunt Sally in both The Cat and the Canary and The Cat Creeps. 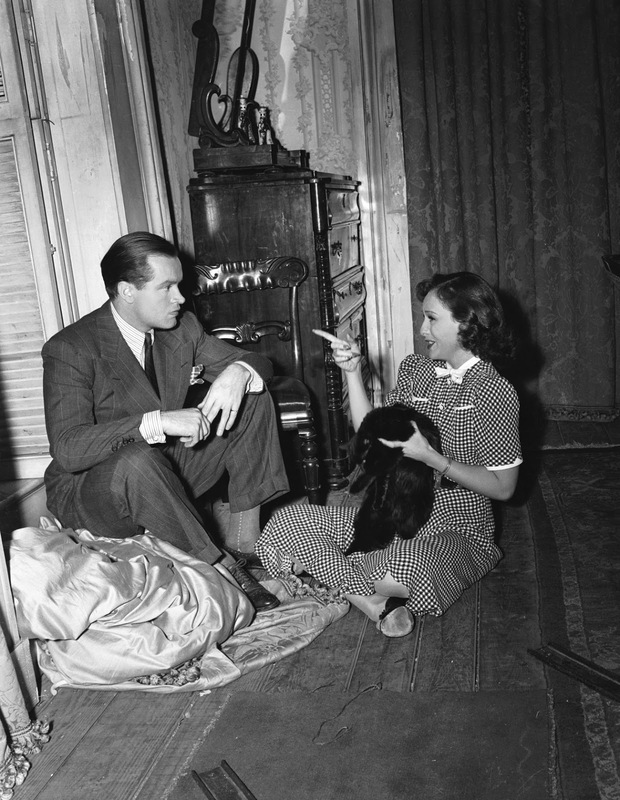 Bob Hope and Paulette Goddard on the set of The Cat and the Canary (1939). Other critics: The Cat and the Canary has a 64 percent positive audience rating at Rotten Tomatoes and Leonard Maltin calls the film an "entertaining remake of the venerable 'old dark house chiller'" in a three star review for his Classic Movie Guide. Critics in 1939 mostly praised the movie. Frank S. Nugent of The New York Times lauded Paramount execs for having the "wit and wisdom to produce a nonsense edition of John Willard's old shocker" while Variety praised Hope's "straight dramatic characterization, with comedy quips." The bottom line: The Cat and the Canary is both a great horror comedy and a scary horror film. Watch it for Hope's charismatic performance and some fun, old-fashioned goosebumps. Availability: The Cat and the Canary is available on DVD. Next week, I'll begin November's theme of movies about American Presidents with director John Ford's biopic, Young Mr. Lincoln (1939).